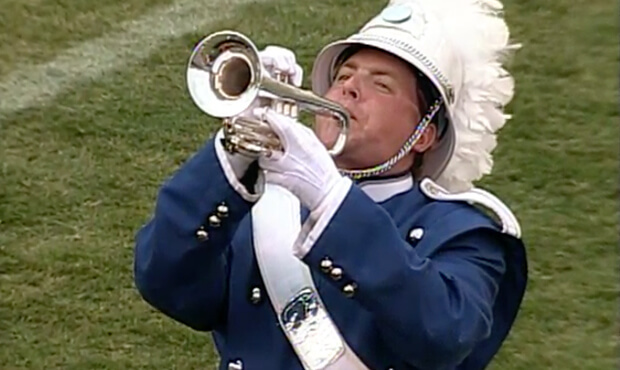 The 1998 season culminated with the end of Drum Corps International's three-year commitment to take the World Championships to Orlando's Citrus Bowl Stadium. Much of the excitement the last few days of the season was in witnessing the Cadets of Bergen County place 3rd in the Quarterfinals competition before moving up to 1st in Semifinals and Finals. 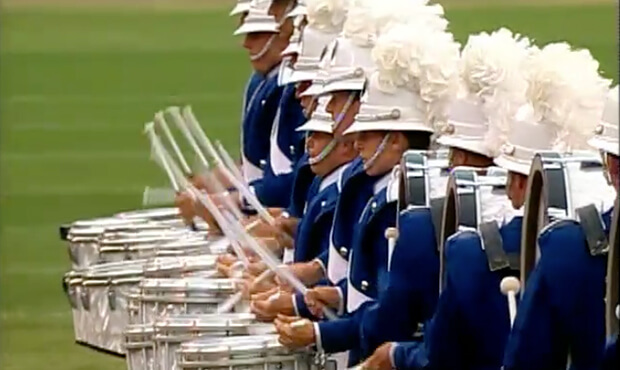 Other notable happenings were Glassmen taking 5th place which marked the corps' highest finish ever, and the 50th anniversary celebration of Cavaliers. Bluecoats' 10th-place production of "The Four Seasons of Jazz" was the biggest feel-good offering at the Finals, full of catchy pop tunes that had been majorly popular in America over the prior several decades. Even though the first two of the four musical selections had the word "Spring" in the titles, the opening of "Spring Can Really Hang You Up the Most" was set to represent the tail end of winter. Tommy Wolf composed the song, but he remains all but forgotten, overshadowed by poet Fran Landesman, the lyricist for the work. One day in 1952, Landesman was sitting in the St. Louis nightclub she ran with her husband when she was inspired to write song lyrics based on a musing by fellow poet T.S. Eliot, who's work also became the foundation for the Andrew Lloyd Weber musical, "Cats." Eliot had opened his poem, "The Waste Land," with the line, "April is the cruelest month." Landesman presented the lyrics to Tommy Wolf, the nightclub's pianist. The result became a major pop hit and led to further collaboration between the two artists. The big band jazz chart arranged for the Bluecoats started with the tinkling of mallet keyboards, perhaps representing the awakening of spring, as horns and percussion closed in around the color guard. Flags of icy white and melting-water blue provided just the smallest amounts of color. Upon reaching the first stationary form of the show, solid flags of a multitude of colors, each one a different hue, burst forth like spring flowers poking through the soil, releasing their visual energy upon the barren landscape. Each guard member wore a smock the color of the flag, with some of the members moving to sabres for the next musical selection. Richard Rodgers composed "It Might as Well Be Spring" for the 1945 film, "State Fair." His lyricist partner Oscar Hammerstein II wrote the lyrics, resulting in an Academy Award for Best Original Song. "State Fair" remained the only original film score by the Broadway power duo, though many other works of theirs during the 1940s and 1950s for the Broadway stage were eventually turned into blockbuster films, including "Oklahoma," "Carousel," "South Pacific," "The King and I" and "The Sound of Music." The film musical was based on a novel of the same name and was a remake of a Will Rogers 1933 non-musical film, also of the same name. On the field, its heavy feel-good swing, with screaming brass soloists, was much in the spirit of Bluecoats' tenure as a DCI finalist, which started in 1987. The next selection was "Summertime," originally an aria from George Gershwin's 1935 folk opera, "Porgy and Bess." Lyrics were adjusted from DuBose Heyward's novel, "Porgy." Originally, Gershwin was attempting to latch on to the spirituals popular in African-American folk music, but he ended up accomplishing much more, as "Summertime" became one of the most recorded songs in musical history. The opera dealt with life in the slums of Charleston, South Carolina and made waves for opening on Broadway with a cast entirely composed of African-American singers who had been classically trained. Still, musicologists had difficulties considering it an opera for its first four decades, after which it was restaged in major cities throughout America, sealing its operatic credentials. With an Afro-Latin beat supplied by hand percussion, and color guard members swathed in vibrant orange skirts with yellow flags of the blazing midday sun, Bluecoats' arrangement captured the searing heat of the season. The work ended on an unexpected down, as if summer had come to a close and people turned their attention away from fun into the sun toward the coming cooler months. The corps first made the DCI World Championship Finals with "Autumn Leaves" in 1987 and 1988, establishing the piece as Bluecoats' corps song. Originally, it was a French song from 1945, "Les feuilles mortes (The Dead Leaves)." After a slow opening, the corps cranked up the heat to remind all that the season of autumn can still be quite hot. Brown flags captured the look of plant life having lost its bright summer colors, leading to flags of forest green and wheat yellow that were emblazoned with dark red streaks representing blowing leaves freshly fallen from the trees. Pushing the season up to the verge of winter, the full corps propelled itself to the front sideline for one last celebratory blast prior to the arrival of cold weather and snow. For this week only, you can save on the Legacy Collection DVD that contains this complete Bluecoats performance, along with all finalists from the 1998 DCI World Championships.